This Bourgault 3710 tool with a Model 6550 cart was one of two units tested in the PAMI study. Some surprises emerged from recent Prairie Agricultural Machinery Institute (PAMI) trials that studied air seeder distribution and damage. For the canola trials, PAMI used seed and fertilizer to represent a typical operating condition and interaction between the seed and fertilizer granules. Higher air flow rates produced by higher fan speeds reduce the risk of plugging in the distribution system. But the test sought to explain how this can affect distribution and seed germination in order to allow producers to adjust their air flow, or metering rates, to accommodate any changes, if necessary. Grieger, an agricultural engineer, said he expected to see fan speeds have a greater impact on seed germination. Average rate of germination for canola was 96.4 per cent at low fan speed, 96.0 per cent at medium fan speed and 95.2 per cent at high fan speed. 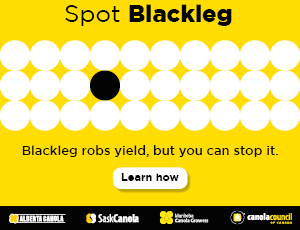 Although finding the reason why wasn’t part of the study, he thinks it might reflect the smaller size of canola seeds, which lessened the chances of them sustaining damage. Not only was there little damage, but the higher fan speed actually improved the variation of seeding rates across the drill when canola was applied with fertilizer, Grieger notes. In trials comparing results for canola, wheat and soybeans, canola generally had the greatest variability in distribution. Manifolds on the outer extremes tended to receive less product. Grieger says the high amount of fertilizer that’s put down with the canola seed accounts for at least some of the variation. This John Deere 1890 seeding tool with Model 1910 cart was one of two units tested in the PAMI study. 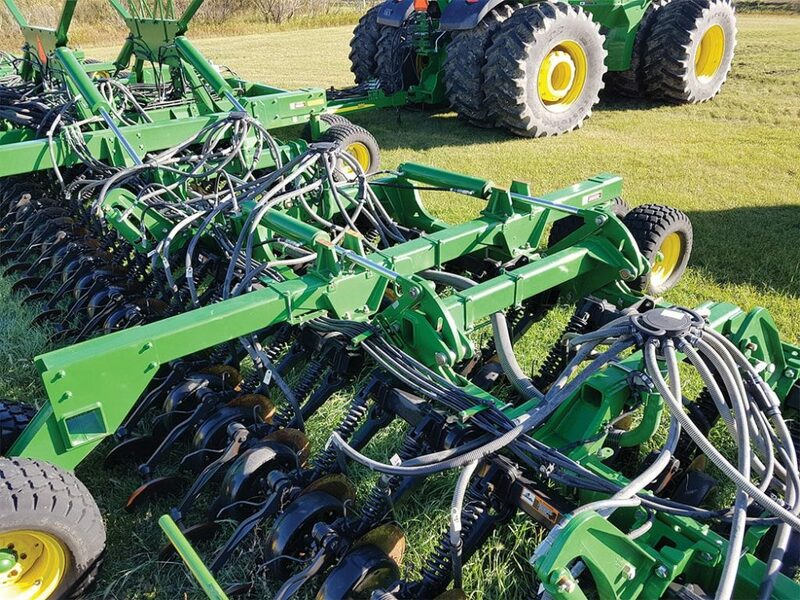 The trials, conducted last year, used two used 60-foot air seeders – a John Deere 1910 cart and 1890 tool and a Bourgault 6550 cart and 3710 tool – and three fan speeds: high, medium and low. The low speed was the lowest recommended by the manufacturer. PAMI increased fan speed by 15 per cent for medium and another 15 per cent (or up to the max speed recommended) for high. 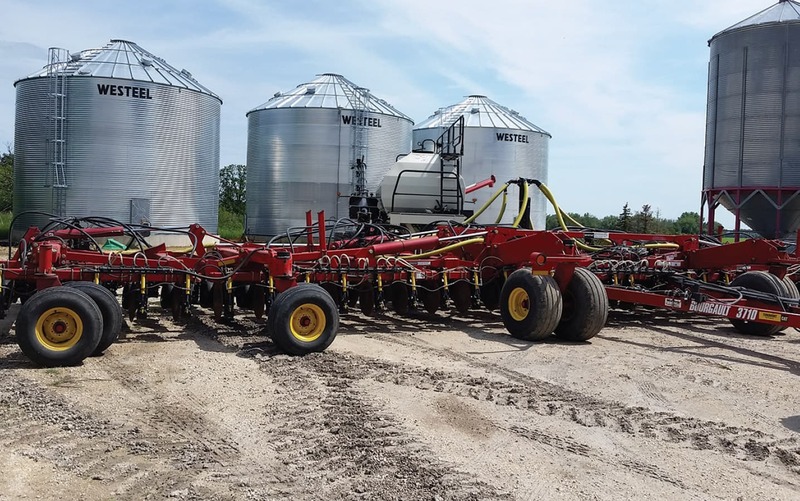 Both units are effective at metering all seed types and delivering seed and fertilizer across the width of the seeder, he says. Grieger adds both systems have variability but are in the range he would expect for wide distribution systems moving large quantities of product and having seeded thousands of acres. Grieger planned to have full study results available at the Crop Connect Conference in Winnipeg in February. By now, results should be free for download on PAMI’s website at pami.ca. Grieger thanks the producer groups Manitoba Canola Growers, Manitoba Pulse and Soybean Growers, and Manitoba Wheat and Barley Growers Association for their support.